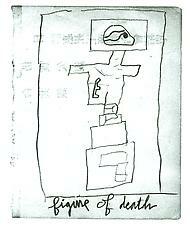 Between 1963 and 1965, Ray Johnson printed thirteen pages of his Book about Death with the Pernet Printing Company. His title, which designated the thirteen unbound pages as a book, is A Book about Death, yet also A Boop about Death and A Boom about Death. 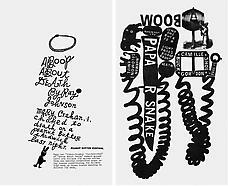 Those thirteen offset pages were reprinted in 1976 for the catalogue, Ray Johnson: Correspondence. A book was published in conjunction with the exhibition. More information on the publication can be found here.